I am soooooooo excited! This is my last week of work, then I am off the whole week of Thanksgiving! I get to relax bake, work on my blog and gear up for Black Friday!! Yes, I’m one of those crazy’s that goes out on Black Friday! But I don’t go to stores like Target and Walmart! I did one year and I thought I would go bonkers with all those people and rude one’s too!! I had them running into me, banging me with their elbows and don’t even get me going with the lines! I personally like shopping online, it’s safer and faster!! Today I have a healthy, gluten-free cookie that I is perfect for snacks or grabbing as your running out the door in the morning!! Let me introduce to you the Breakfast Cookies!! I got this recipe from Growing Up Gabel, as part of this months Secret Recipe Club, I got to search all over Camille’s site and I found so many wonderful recipes! I saw one for Pumpkin Snickerdoodles that I plan on making next! Snickerdoodles and Pumpkin together, yes please! Two favorites in one, sounds like a winning combination! Why didn’t I make them? Because I couldn’t get my brain to stop thinking about Camille’s Breakfast Cookies! I will admit I did change up this recipe but only because I have no self control! I knew since they had oats in them, no one in my family would eat them, so I had to make them as healthy as possible because it would just be me eating them all, and boy have I enjoyed eating them. I grabbed one on my way to work and I would have one when I came home! For my afternoon treat I would smother some peanut butter on top! 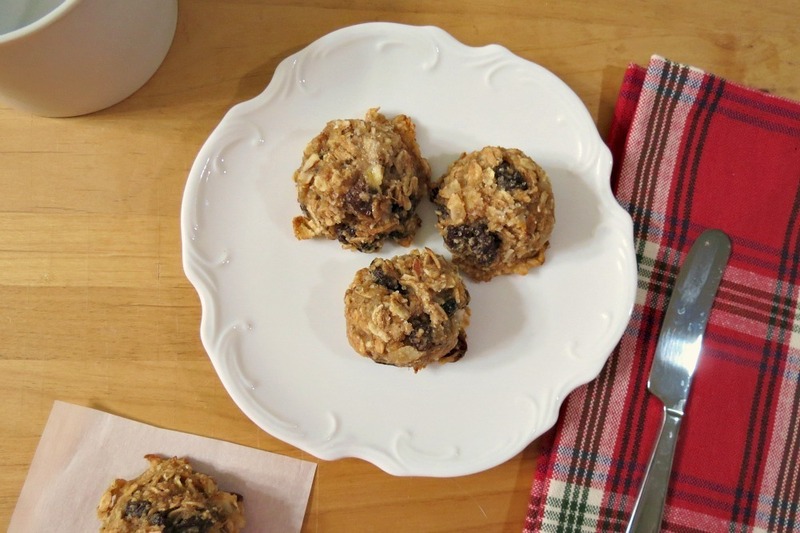 These cookies taste just like baked oatmeal! 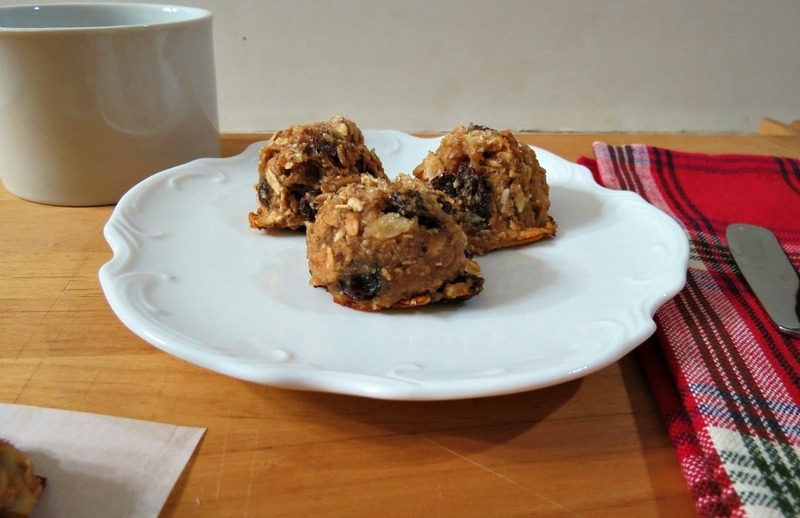 They are loaded with raisins, oats, slivered almonds, banana, cinnamon and honey! Yummy!!! When they came out of the oven they are crispy, but soon soften due to the banana and lack of fat. I stored these in the refrigerator for safe keeping! I am so happy that I found or should I say given to me, Growing Up Gable, because now I have a new cookie that I love! When I saw the photos of the cookies on Camille’s blog my mind started racing about all the add in’s I could use. Camille suggests chocolate chips in them and I will most definitely be doing that when I make these again! I could have made them a tad more sweeter or instead of honey, maybe add maple syrup! 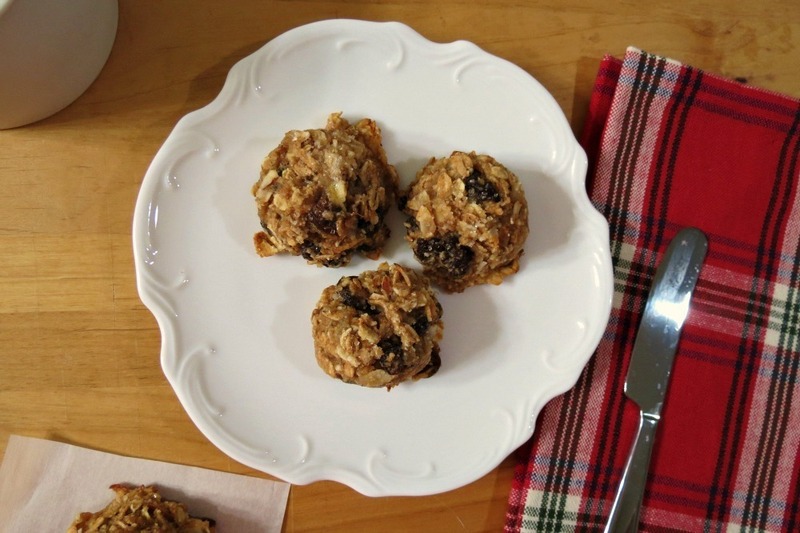 Camille came up with a brilliant recipe when she made Breakfast Cookies! Thanks Camille!! I love your blog and can’t wait to explore more of it!! 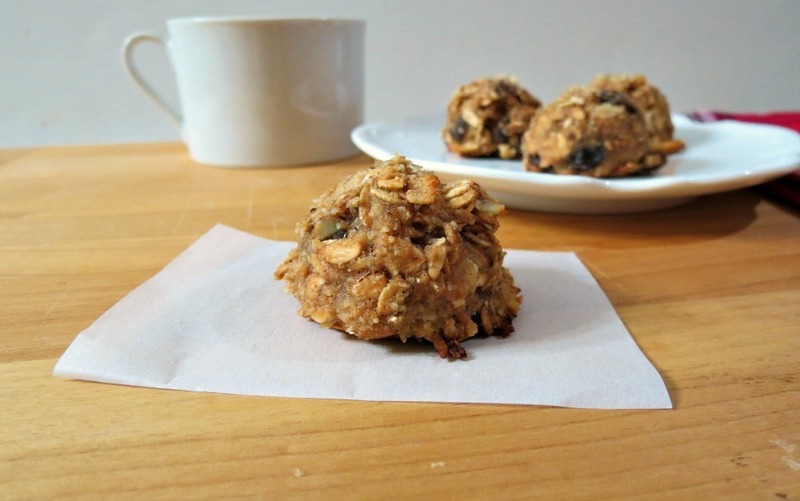 A healthy, gluten-free cookie made with oats, banana,almonds and raisins. Perfect for a grab and go breakfast! In a large bowl stir together applesauce, banana, honey, salt, vanilla and cinnamon. Scoop batter on to cookie sheet and sprinkle with sugar. Allow cookies to sit on cookie sheet for a few minutes until they are set enough to move to cooling racks. Now be sure to check out everyone else Secret Recipes! That’s one of my favorite reasons for being apart of this group!! Have a wonderful week everyone!! I think after writing this post, I’m going to make more cookies!! I love the changes you made! These can definitely be as healthy (or not) as you want. Thanks for sharing! I LOVE your blog! You have so many wonderful recipes! I tried to leave a comment to your blog, but it wouldn’t let me!! These cookies will brighten any morning… or snack time… or late night… Thanks for sharing. They look tasty and perfect for breakfast! Thanks, they are a perfect pick-me up snack! I am definitely trying these they look wonderful! Don’t you just love having the week of Thanksgiving off? I always request it off, every year!! I refuse to go OUT shopping on black friday…but online shopping I can totally handle! I need to get some healthier munching food in my life. These sound awesome! Thanks JoAnne! I magine living in NY would be fun at Christmas time! I hope you take pics of time square, Macys ect… I’d love to see it on your blog! Cookies for breakfast? Yes, please. I love how healthy these actually are!!! Thank you! I’m glad they are healthy, so I don’t feel bad if I eat more then one! 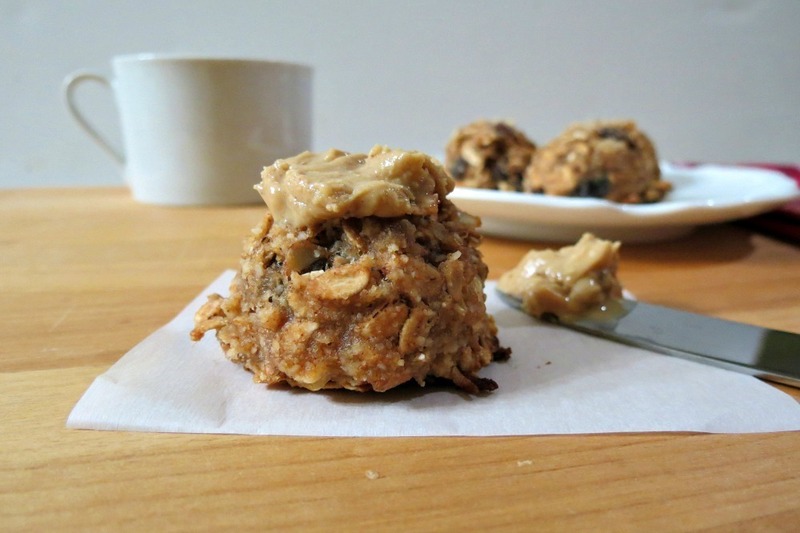 I love a cookie that is healthy ,and adding a little peanut butter to it is genius. I’m off next week too! And my family needs breakfast…these will be perfect! YUM! This is a great treat to have for breakfast and even better for an afternoon snack! I need to make more of them! These look interesting…I’m sure my boys will love them! Nice choice for SRC. Yum! Healthy and gluten free!!! I will be shopping online, haha, I can’t handle the crazies! Have fun on your “homecation” those can be the best! I love getting out there on that crazy day, it puts me in the holiday mood!! Cookies for breakfast? Sign me up! If I may, I’d like to invite you to submit your photos to the new YumGoggle, a photo sharing site with the philosophy that if you worked hard to cook it and photograph it, we should show it off! Hope to see you there soon! Wonderful cookies, and one more RecipeNewZ feature: http://www.facebook.com/RecipeNewZ Congratulations, Jen! Thanks! I love Camille’s blog! She has so many wonderful recipes!! I can’t wait to explore more of it! I can’t wait to try your Breakfast Cookies, I love the flavor combination, and this is a great recipe for the SRC.